Carefully considering your specific requirements means choosing the best possible options and value proposition for your needs. Our range of services brings added value to our comprehensive product portfolio, allowing us to provide a complete turnkey operation. To ensure our products are utilised to provide optimum efficiency and return on investment we offer complete design solutions. Our design services may be used to design complete refrigeration control systems which include all our system optimisation techniques to minimise energy consumption through to bespoke interfaces between the refrigerant leak detection equipment and alarm indication/HVAC extract systems. In addition to our standard range of products we can offer bespoke manufacturing of control panels, control systems and micro processor based devices to suit individual customer requirements. Years of experience in our specialist field, and attention to detail, are utilised in our manufacturing process. 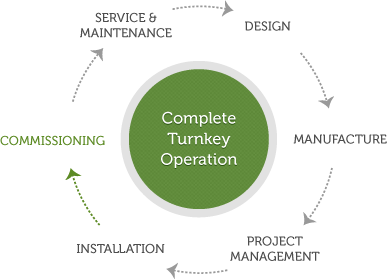 We offer professional Project Management for all of our products and services. This enables us to maintain high quality standards from inception through to the final project delivery and commissioning. Our project management services will ensure your project is delivered promptly and effectively to an agreed programme. We believe this philosophy provides increased customer reassurance and satisfaction. We employee a nationwide team of field service engineers directly who are able to undertake installation and commissioning of all our products and initiatives. Our dedicated team of professional engineers are fully qualified and will ensure a quality installation is delivered to meet your specific requirements. We recognise that when significant investment has been made to manufacture and install our equipment it is essential to ensure it is correctly configured and commissioned. Whether the installation is conducted by our customers directly or by our installation team, we strongly recommend that we are employed to commission the equipment. The commissioning process is an extremely important part of the services we provide and will give our customers the reassurance that the equipment we have supplied is operating at its optimum efficiency. Our fully trained directly employed engineers can provide a bespoke maintenance regime to ensure optimum performance of our products and initiatives whilst ensuring that legislative obligations are met. In the event of equipment malfunction, service agreements mean a fast and efficient call-out and repair process. No matter how well the equipment has been designed, manufactured, installed and commissioned, the possibility for failure cannot be ignored. Programmed preventative maintenance can extend the life of an item and reduce the likelihood of down-time in the future. Preventative maintenance will also enable the equipment to be updated in line with the latest technological advances and standards as well as giving the greatest return of investment.